Dilwale Team Celebrate 20 Years of DDLJ : There is no introduction needed about Aditya Chopra’s Dilwale Dulhania Le Jayenge Film. Because it is undoubtedly one of the best romantic movies of Bollywood and it remains in our hearts forever. DDLJ Completed it’s 20 years. So, Shah Rukh Khan & Kajol decided to celebrate this DDLJ 20th anniversary in a romantic and unique manner by recreating the magic feeling of Dilwale Dulhania Le Jayenge. The film’s songs, dialogues and the sizzling chemistry between Shah Rukh Khan and Kajol are still fresh in people’s minds. SRK & Kajol currently busy with the shooting of Dilwale which is directed by Rohit Shetty at Hyderabad. Hope this Rohit Shetty’s Dilwale movie will be remember our favourite flick DDLJ. Yesterday Shah Rukh Khan Tweeted “Should do a picture with [Kajol],” “Want to thank Team Rohit Shetty & Red Chillies for doing this last minute. 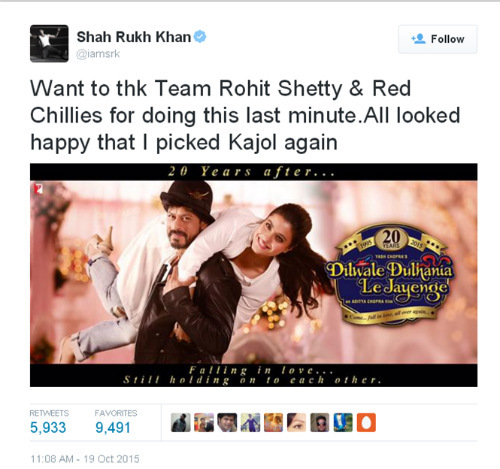 All looked happy that I picked Kajol again.” This Video directed by Rohit Shetty to celebrate #20yearsofDDLJ. YRF then posted this video… From the time of posting the video creating viral waves in social media. Check out the Video in below. Did you watch the Dilwale celebrate #20 years of DDLJ Video ? Don’t worry. Here is the exclusive video Will Make You Fall In Love once Again. After watching this video you definitely love with this duo once again. Share this Dilwale Video Celebrating 20 years of DDLJ to your friends and remember them how cute the film was. Bruce Lee First Weekend Collections Worldwide, India, AP & Telangana.